We are very proud to have been announced as finalists in the Westpac Business Awards 2018 for three categories; Excellence in Customer Service Delivery, Excellence in Marketing and Excellence in Community Contribution. Bring on the finals in October! 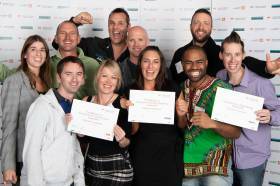 Thanks to all our awesome team. We had an awesome day on Saturday 16th June, with SPCA returning for 'Jump To The Rescue 2018'. Over $102,000 was raised, and with an original target of $60,000, it has been an incredible success. 118 people signed up to fundraise for this charity jump. Since last year's event at Skydive Auckland, regional SPCA branches had merged to become SPCA New Zealand, so the event itself went nationwide and a choice of three dropzone locations around the country were offered to those fundraisers who successfully raised the target $880, to get their free skydive and 'Jump To The Rescue' from 13,000ft. 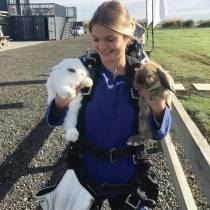 We had a great sunny day in Auckland with the 23 animal lovers that visited on Saturday to skydive, not to mention the supporting rabbits and dogs that come out to visit! Well done guys. We now have our own shop in the CBD! Come visit us on Elliott Street, see the skydiving action on our huge TV screens, chat to a member of our team and of course book a skydive. Find out about both our North Island locations, Skydive Auckland and Skydive Taupo at our container shop. See you there. We are very proud to have won the North West Business Awards 2018 for Recreation Category AND also the Supreme Award! Big thanks to everyone in our team who helped make this happen, and all of our supporters. 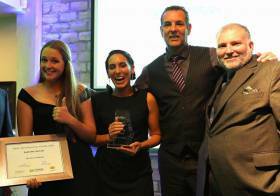 After being nominated, the awards were judged on a combination of mystery shopper results, public votes and a written submission detailing our business goals, opportunities, behaviors and successes. We are so passionate about what we do and it's great to be part of North West Country. SPCA Jump to the Rescue 2018 - Sign Up NOW! 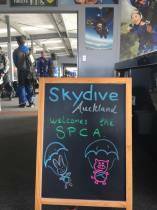 SPCA are back at Skydive Auckland for Jump To The Rescue 2018. Sign up here to start fundraising for NZ's abused, unwanted and unloved animals. Raise $880 and receive a FREE 13,000ft skydive. Find out more here.